CARLSBAD, Calif., Sept. 13, 2016 /PRNewswire/ -- On Saturday, September 10, NAMM's Museum of Making Music (MoMM) celebrated the debut of Spotlight on Casio, the latest addition to the museum's many exhibits and musical instrument collections. Open now through January 29, 2017, the new display chronicles Casio's 35 years of electronic music product innovations and features notable instruments including its first keyboard, the Casiotone CT-201; the AZ-1 classic "keytar"; the popular Privia digital piano (PX-560); a full 88-key Grand Hybrid action sample; and its newest digital piano, the CELVIANO Grand Hybrid. In addition to the display, visitors will be able to play a Casio Privia PX-160 in the interactive area of the museum. The hands on playing experience, along with the robust display of 14 Casio electronic musical instruments, serves to connect the company's many innovations directly with the public. It's a connection that underscores the mission of the museum. "At the museum, we showcase the vibrant legacy of musical instruments and seek to connect our visitors through a hands-on approach," shared Carolyn Grant, MoMM's Executive Director. "We are excited to highlight Casio's important contributions to our industry and to share its history with our many guests." 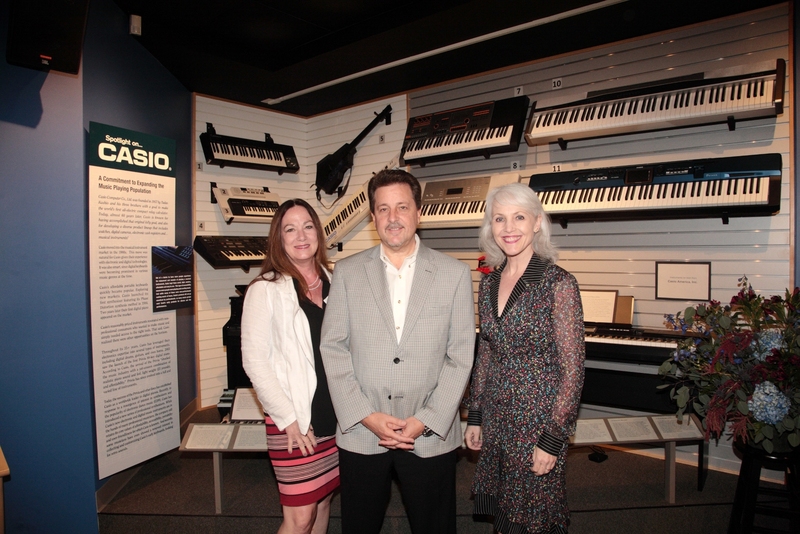 The opening champagne reception was attended by MoMM members and donors, NAMM staff leadership, Casio fans and Casio leadership, including Alli Colasacco-Sharpe, Marketing Communications Coordinator; Sandra Jordan, Education Consultant; and Stephen Schmidt, Vice President of Casio's Electronic Musical Instruments Division, who expressed his pleasure of the new exhibit. "As a worldwide leader in digital pianos, we are honored to be part of the NAMM Museum of Making Music," said Schmidt. "At Casio we understand the importance of providing musicians with high-performance instruments that foster creativity and deliver great sound. We are thrilled that NAMM has recognized the top-notch quality of our electronic musical instruments and invited us to be part of this exhibit." As part of the reception, attendees were treated to a performance featuring multi-talented keyboardist, Steve Weingart. Weingart has enjoyed a career spanning 20 years, and has performed or recorded with the likes of Dave Weckl, Chaka Khan, Eric Marienthal, Victor Wooten, Warren Hill, among others. Earlier in the day, Weingart presented a piano technique masterclass where participants used WK6500 keyboards donated by Casio. The Spotlight on Casio display will be open until January 29, 2017. The Museum of Making Music is open Tuesday through Sunday and free to all current NAMM members. Opened to the public in March 2000 by NAMM, the Museum of Making Music (MoMM) is located on the first floor of NAMM's global headquarters in Carlsbad, California. The Museum was developed to celebrate the vibrancy of the music products industry and to showcase the deep impact music that music and musical instruments and products have on us as individuals and as a society. MoMM preserves our musical heritage (1900 to today) and provides opportunities for cultural enrichment through special exhibitions, innovative concerts and educational programs for a wide range of audiences.